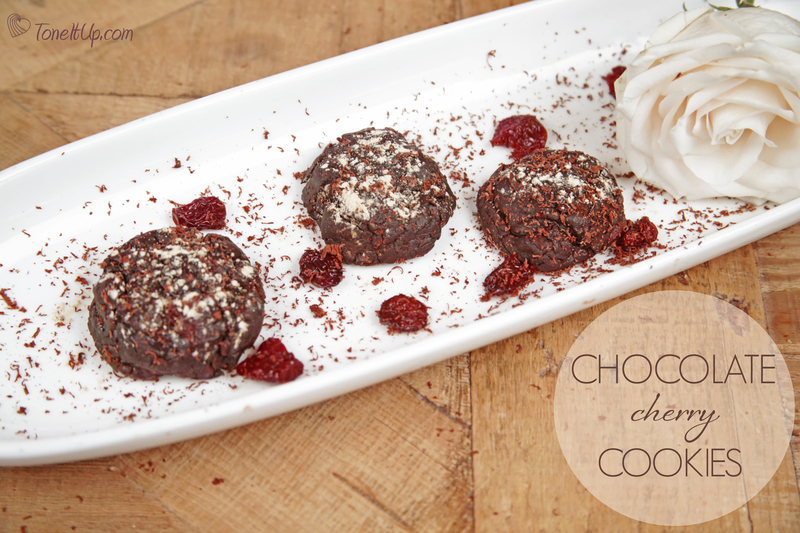 Brace yourself, because these chocolate cherry cookies are out-of-this-world delicious. Gooey, rich, sweet and deceptively healthy, this recipe is simply amazing. We used avocado as the base — surprising, we know! 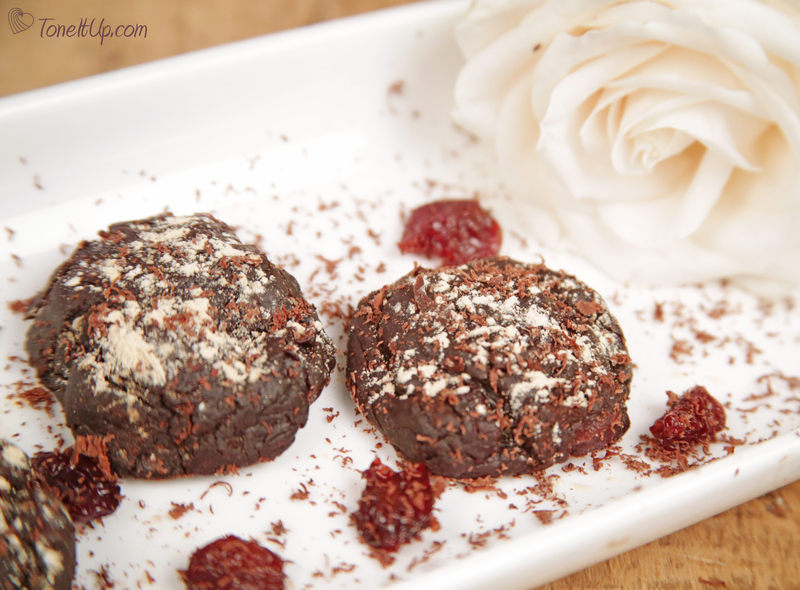 — along with just a handful of other ingredients resulting in a cake-like treat bursting with velvety, chocolate flavor. But the best part is that you’re getting a burst of skin loving antioxidants from the cacao along with a tasty dose of healthy fats from the avocado. Kids and hubbies will love these too…this recipe fools even the finickiest of eaters! Preheat oven to 350° degrees. Add all ingredients, except cherries, to a bowl and use a mixer to blend. You can also add ingredients to the blender or food processor. Once batter is smooth, fold in cherries and if you’re feeling naughty add a handful of chocolate chips to the mix too. Drop onto a parchment lined cookie sheet and bake for 8-10 minutes. These cookies will not spread very much. Dust with some Perfect Fit Protein and chocolate shavings. Did you hear the news!? The 7 Day Slimdown has been revamped… right in time for Valentine’s Day! We’ve included tips and over 10 NEW recipes to keep you satisfied while you get lean & toned! Find all the info and get a sneak peek at at one of our favorite new recipes HERE! The entire team is starting it together on Saturday February 7th! Not a member yet? Join today and we’ll send it to you right away! Become an official Tone It Up Nutrition Plan member HERE! Completely transform your body, build lean muscle and enjoy the healthy, energetic life you’re meant to be living! Join the Tone It Up Nutrition Plan today! Start living the healthy, happy, energetic life you’re meant to be living. Sound delicious! What can I replace the coconut sugar with? I’ve had success with using it interchangeably with brown sugar, though brown sugar might add a little more moisture to the recipe. If you are in the states you can find coconut sugar almost anywhere though – my middle-of-nowhere Walmart carries the madhava brand for pretty cheap! Because I live in Greece and I don’t know where they sell coconut sugar and oat flour, can I use instead brown sugar and regular flour?Or the flour that we use to make cakes? Check out my recipe as well! im guessing these are not slim down approved?? Think if I made these vegan by subsituting applesauce for the egg they would still taste good? These cookies look so good! I will try them for sure! I posted a recipe of no egg no butter cookies on my blog! let me know what you think!! Remembered these from LYB challenge and just getting around to making them. They are surprisingly yummy. I baked for about 15-18 mins because they were too soft at 10 mins. Replaced cherries with cranberries since this is what I had on hand. This is a really good base mixture! Could easily add nuts, other dried fruits, and I bet amazing with choc chips as suggested. Enjoying now with a cup of hot tea. :) Calculated calorie content ~97-110 per cookie depending on batch size (I made 7). Do you have an alternate ingredient that I can use instead of a ripe avocado?? I’m allergic to avocado :( And I would LOVE to make these one day!! !